I have an awesome cosplayer to introduce you to today. 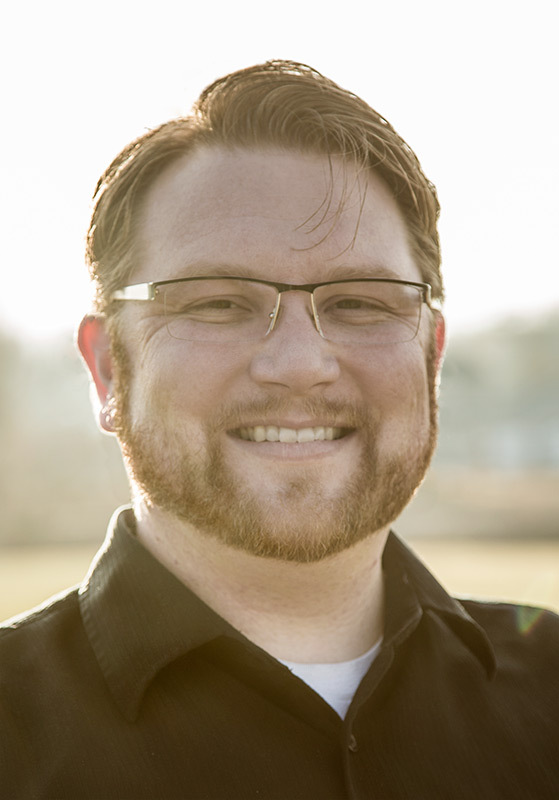 His name is Jon Robinson AKA Ronan Angelos. Check out his Space Marine from WarHammer! His real name is Jon, but during all of our staff meetings we’ve referred to him as Ronan, so I’m going to keep going with that. Ronan is just plain awesome sauce. A super friendly guy, we’ve seen him at several conventions. He always has a fun happy attitude and works hard to help other people where he can. We have a particularly fond place in our hearts for Ronan because he was our very first ever Google+ follower. Yep, that’s right, we have a Google+ page. We started out with a Twitter and this news site, but then not long ago added Facebook and Google+. Well Google+ still only has 10 followers total, but Ronan was a very early adopter and for a long time was our token follower. So we’ll always remember him for that. Anyhow, I digress. 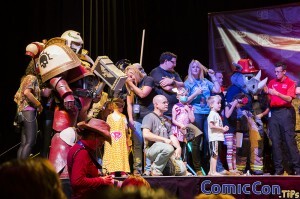 Ronan is getting to be a little famous at the Salt Lake Comic Con scene and was even invited to stand on stage and help introduce some of the guests at the opening Press Conference. 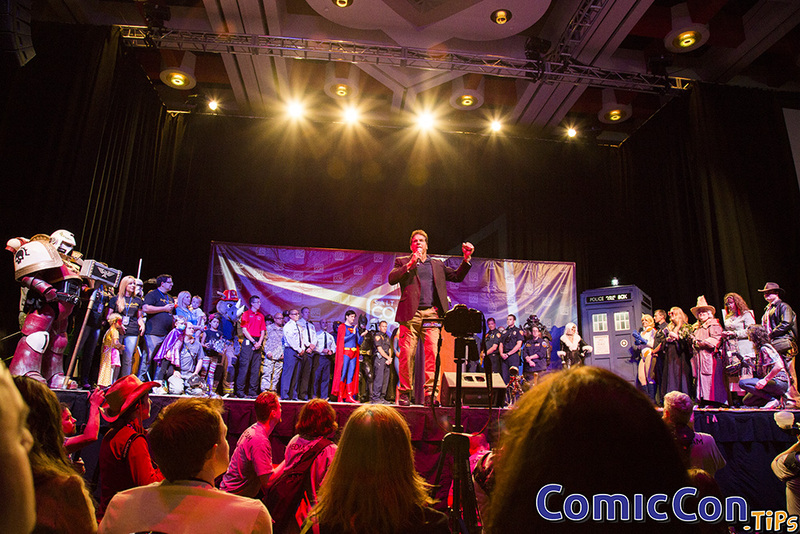 -My first time was last year at Salt Lake Comic Con, so Its been a full year. – Once I heard about Comiccon happening here in Salt lake I knew I wanted to dress up. I had first started looking for a Stormtrooper outfit. 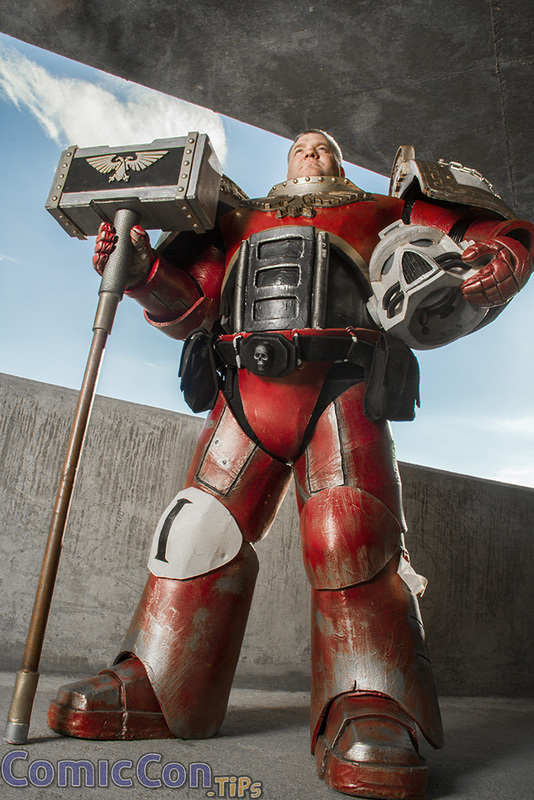 After poking around the internet I came across a group of people who did Space marine costumes. i am a fan of the whole universe and i knew that would better fit by body type. So I got started on building it. -I had never been to a convention before, so I went the day before in regular clothes to scope it out. I knew I still wanted to do it. 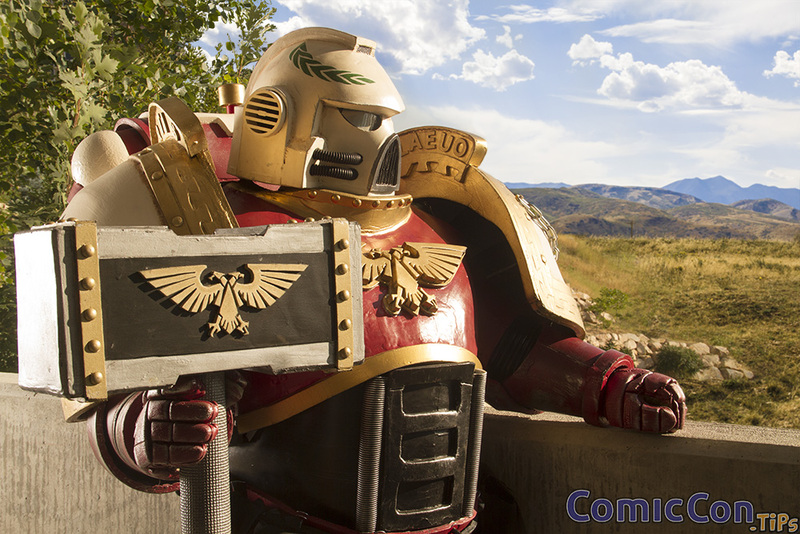 So the next day I took my son, we dressed up, I donned my Space Marine and walked in the doors. I was very nervous and thought I would hear lots of negative things about accuracy. What I experienced though was the exact opposite. There were just so many people praising my costume. Everyone from little kids to grandparents wanting my picture, so I got over my nervousness real quick. What has been your favorite character to play and why? -It would have to be my Space Marine. It literally can stop traffic. I’ve had people try taking my pic from a car as I’m walking down a sidewalk. It gets the best reactions. Even if they have no idea who i am, everyone still wants a picture. -I would have to say Apoxy Sculpt. You can do a lot of things with it. Any future costumes you are thinking about doing that you can tell us about? -Well I’m thinking about a lot, but there are a few that are moving to the front of the line. One is based on the Fallout video game and another is Marvel Hero. As to specifics, I don’t want to say, just because they may or may not happen. What had been you’re most fun experience costuming? -It is getting to know the other cosplayers. Learning about different techniques and in turn teaching others ones that I know. There are a few people that I have given tips to or ideas, and to see them with their completed costume is the best. Just helping them build the best costume they can. What top 5 tips do you have for cosplayers just starting out? If you dress to impress the fans, you might not please 100% of them, but if you dress to impress kids you will always win and the rewards are better. Take the opportunities to learn a new skill. Most of us are willing to show you how we did a particular piece even give you a list of supplies you need. There are only 2 requirements for cosplaying; Wear a costume and play. If anyone tells you differently they are wrong. Make friends. If you like someones costume even if you don’t know the character, ask them about it. They will usually tell you all about the character and show you how they made it. Or he’s very active on the Cosplay Utah Facebook group. If you have a cosplay costume that you’ve built that you would like to show off in one of our Meet & Greet articles, fill out our Contact Us page and let’s get talking!